Say, a date you know won’t end responsibly, tucked into a weathered brick cove. Filled with red wine, a thick haze of wood-fired meats and, of course, some random birdcages. 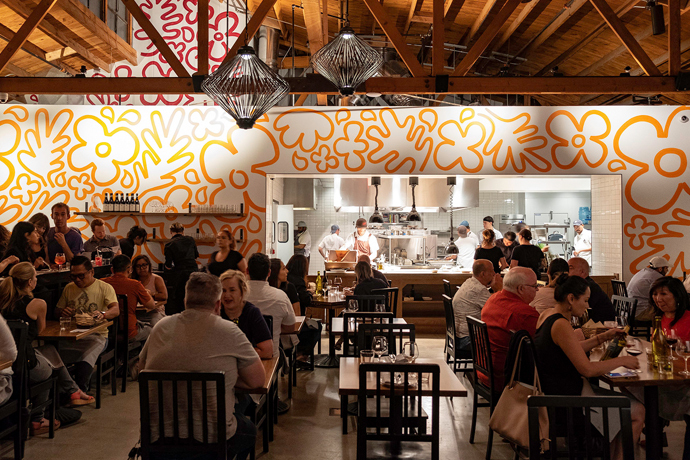 Welcome to The Spice Table, an elegantly dilapidated shack of pork satay and short rib stew from a Mozza vet, now soft-open in Little Tokyo. Then you’ll duck through a small dining room and into another little cavern. Quarters are tight, the lights are dim, and everybody will probably be having a little too much wine under some strung-up birdcages. And you’ll smell something. Maybe it’s Curry Fried Chicken Wings mingling with Black Pepper Crab Toast. Maybe it’s Oxtail & Short Rib Stew. In fact, it might feel a bit like you’re in Singapore. Or maybe Vietnam. The chef’s from the former, his wife from the latter—and her sister brought the birdcages. No one makes birdcages like Saigon.